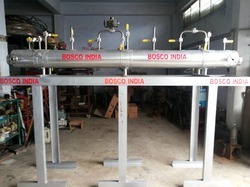 Manufacturer & Exporter of CO2 Cylinder Filling System. Our product range also comprises of CO2 Recovery Plant, CO2 Storage Tank and CO2 Generation Plant. We provide the clients with the superior quality of CO2 Cylinder Filling System. Known for its consistent performance, excellent efficiency and application specific design, the offered CO2 cylinder filing system are highly demanded. By following total quality management, the quality of the offered CO2 cylinder filling system is always maintained at our end. Looking for CO2 Cylinder Filling System ?